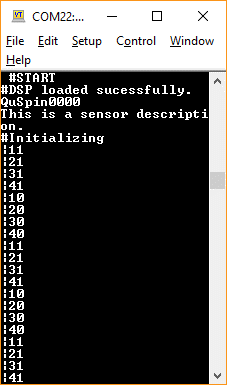 This page provides information on communicating with the QZFM without using the QuSpin sensor UI. 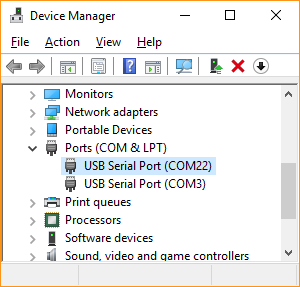 Figure 1: Windows Device Manager showing the loaded driver (highlighted) for the USB Serial Com Port. This page last updated on March 15th, 2017. The QZFM electronics module can accept serial commands directly from a computer through its USB virtual Com port (USB-UART bridge) using any serial terminal emulator (such as Tera Term). The USB bridge uses the FT232RL chip. If drivers are not loaded automatically through Windows, they can be downloaded here. The digital stream from the sensor electronics is classified into four data types, identified by the first character as described below. # Sensor status and response messages from entered commands (as printed in the "Sensor Status" bar of the QuSpin sensor UI). Figure 1 shows the sensor stream during firmware boot up. | LED indicators (|10 is Laser Off, |11 is Laser On, |20/|21 is Cell Temperature Lock Off/On, |30/|31 is Laser Lock Off/On, |40/|41 is Field Zero Off/On, and |50/|51 indicates Master/Slave sensor). 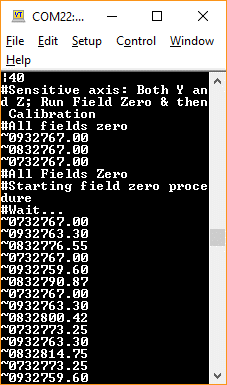 ~ Sensor parameter readout (~04 is cell temp error, ~05 is cell temp control voltage, ~07 is Bz field,~08 is By field, ~09 is B0 field). 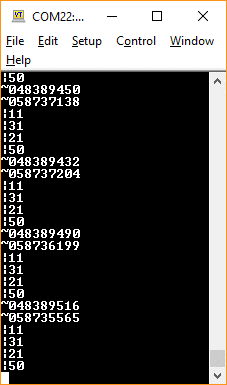 To convert the raw field values, subtract 32768 from the 7-digit number following the two digit identifier. For example, ~0733582.50 = (33582.50 – 32768) = 814.5 pT applied Bz field.
! Magnetometer digital data output (24-bit numbers shown in Figure 6). To convert the raw output to pT, subtract 8388608 and then multiply by 0.01. For example, !8400953 = (8400953 – 8388608 ) x 0.01 = 123.45 pT. The following table provides the ASCII command list for the QZFM (case sensitive). Figure 2: QZFM serial com port digital stream following boot up showing the startup message and the LEDs flashing to indicate a successful firmware boot up. Figure 3: QZFM serial com port digital stream post-Auto Start showing the updating cell temperature values and the LED status. Figure 4: QZFM serial com port digital stream following the Field Zeroing command showing the reboot message and field coil values. Figure 5: QZFM serial com port digital stream following Print ON command showing magnetic data.